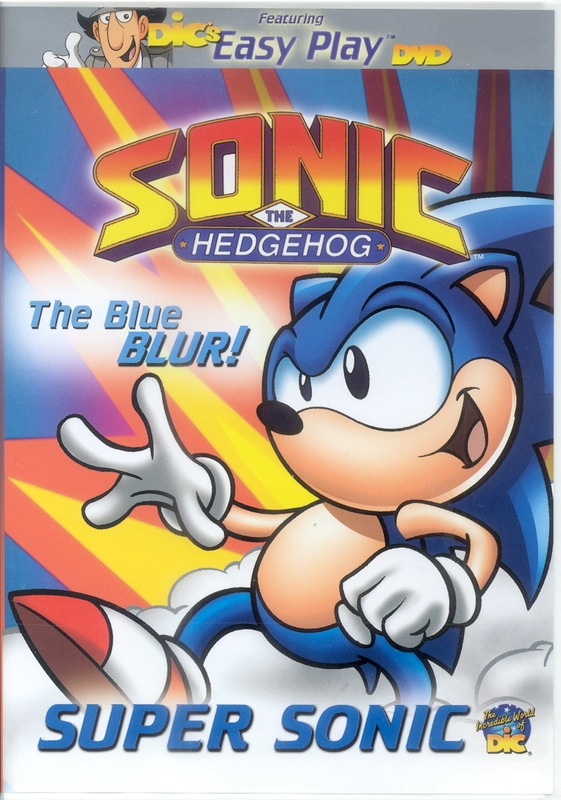 Back in the 90s there was a time where Sonic the Hedgehog was so popular he had not one, not two, but THREE cartoon series. These were The Adventures of Sonic the Hedgehog, Sonic the Hedgehog SatAM and Sonic Underground. Without a doubt the most popular of these shows was Sonic SatAM, so naturally it had some DVD releases. The one I’m going to be looking at is one of the early releases by Dic entitled Sonic the Hedgehog: Super Sonic. Before I talk about the DVD I have to bring this up, if you’ve never used a DVD before (which most people will have but there’s still that minority of people who haven’t) then you’re in luck as this is quite possibly the most user friendly DVD out there. When you put in the DVD and get taken to the menu you get the usual options you’d expect nowadays to play all episodes, select an individual episode etc. 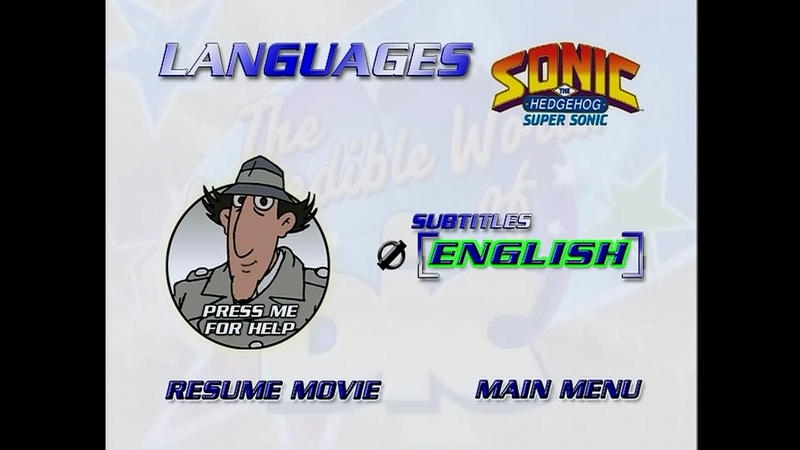 But what you will instinctively notice is Inspector Gadget with an option underneath him saying “Press me for Help”. 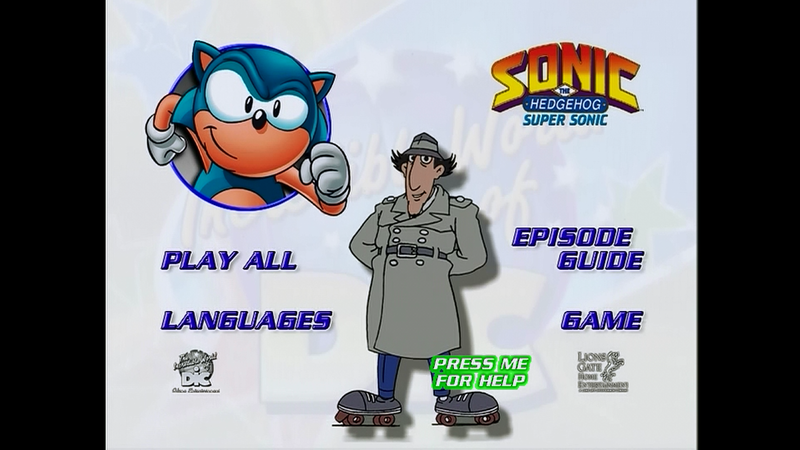 If you press it then Inspector Gadget (voiced by Don Adams) gives you a helpful guide on how to use a DVD remote, what each button on the main menu does and where it will take you. 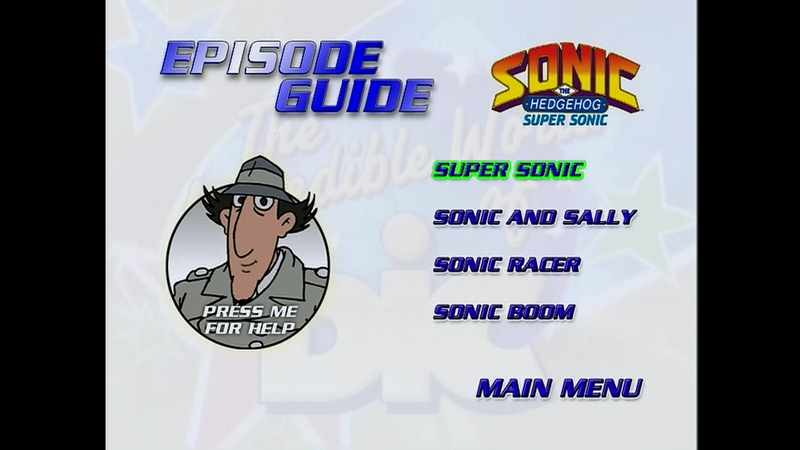 And if you’re worried about leaving the main menu never fear, Inspector Gadget assumes you’re worried about going to a new menu so if you go to say the Episode Guide Inspector Gadget will be there to help you through that menu as well. He talks in such a user friendly and easy to understand language without too much technical jargon, and for DVD vocabulary nerds Gadget defines the name of the selector or the highlight used to select an option by calling it “The Glow”. So whenever he’s telling you to select a button he tells you to do it by “Moving the Glow”. Thanks for clearing up the confusion on what to call the selector, Gadget. One thing I do wish to complain about though is the languages menu only has one option, English. No French, German, Dutch or anything else, and it’s not even languages it’s just an option to turn the English subtitles on or off. So not only does the title “Languages” contain a misleading use of a plural but it’s got mixed up between languages and subtitles. Plus it didn’t need to be its own menu, they could’ve just had a simple option on the main menu saying “Subtitles On/Off” which would’ve saved space on the DVD. But hey it’s more of an excuse for Inspector Gadget to tell you how to work the subtitles. 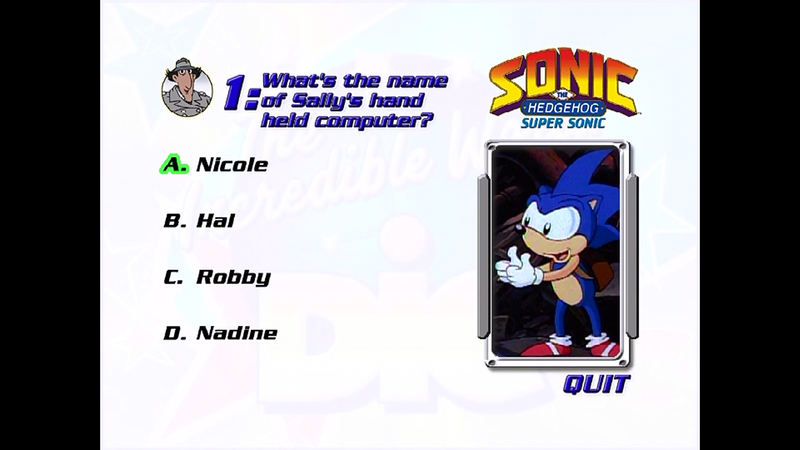 The last thing this DVD menu has is a game, which is basically a trivia game with questions about the episodes on the DVD. When you go to the game menu (guess who’s there to tell you how to work it) there is text that literally tells you how to work the game so on this menu Inspector Gadget feels redundant, but like before this is just a petty little nitpick. So when answering the questions if you get it right it just whisks you off to the next question without indicating that you got it right. It’s only when you get one wrong that it tells you and gives you the option to try again. But it really doesn’t care how many times you get it wrong for you can keep trying again until you get it right. Once you finish the quiz you get to access a bonus episode. You can get this DVD off Amazon for about £2.50 minimum. The DVD contains a selection of four episodes (plus the bonus one) which means you pay a minimum of 50p per episode (hooray for maths). Not only is that good value for money but it comes with the helpful guides from Inspector Gadget to ease newcomer’s anxiety. Only thing is though this DVD was only released in USA which means it is in Region 1 (NTSC) format and won’t work on any Region 2 (Pal) DVD players, so unless you have any DVD hardware which is not region coded then you have to shell out another £30+ for a multi-regional DVD player. Plus you can find these episodes somewhere on Youtube so I’m not sure if it’d be worth the price actually.